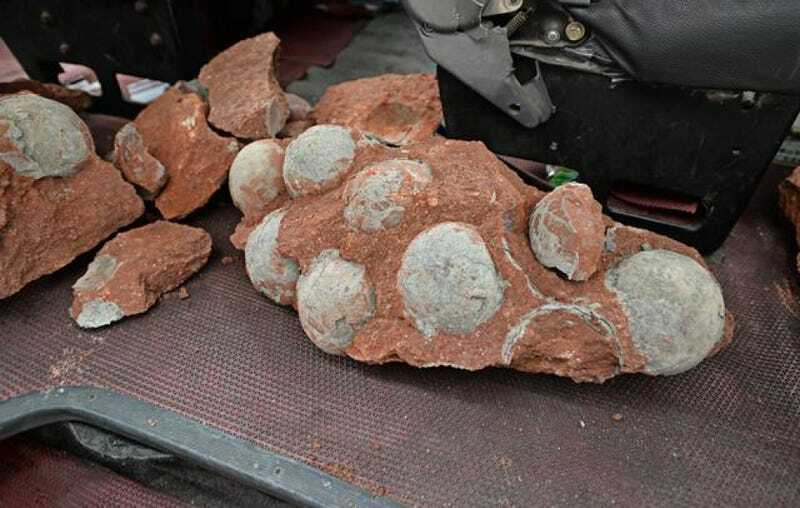 A construction crew working in Heyuan, China have stumbled upon a remarkable batch of fossilized dinosaur eggs. Of the 43 discovered, 19 remain completely intact. Located in Guangdong province, Heyuan is known as the “Home of the Dinosaurs.” Since 1996, some 17,000 fragments of fossilized dino eggs have been discovered in the area. The latest discovery is unique in that it was made in the heart of the city, where construction workers were upgrading the road. The fossilized eggs are quite large, with one measuring 5.1 inches (13 cm) in diameter. Scientists working at the Chinese Academy of Sciences will now examine the eggs in the hopes of determining which species of dinosaur they belonged to.